Racing wraps up in the nation's capital with Sunny Gilbert and Kerry Werner each riding to solo victories. 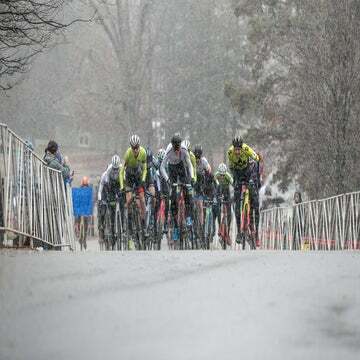 Following up their wins on Saturday, Sunny Gilbert (Van Dessel) and Kerry Werner (Kona) won day two of DCCX at the Armed Forces Retirement Home on the north side of Washington, D.C.
With his win, Werner took the overall Parkway CX Trophy. Gilbert nearly won the women’s title but couldn’t quite overtake Rebecca Fahringer (Kona). Three-time DCCX winner Arley Kemmerer (Fearless Femme) hit out first in the women’s race, taking the holeshot. Gilbert wasted no time moving to the head of the field, but she slid out on a corner soon thereafter. After things settled down, Gilbert, Fahringer, and Kemmerer were at the front. By the halfway point, Kemmerer had faded out of the picture, and that’s when Fahringer had some troubles of her own. First, the Kona rider flatted, forced to ride the rim to the pit. She found herself about 10-15 seconds behind. Fahringer put in a big effort and came within about three seconds of Gilbert, but then disaster struck again. Caroline Nolan (Voler-Easton) out-sprinted Fahringer for second place, about 17 seconds behind Gilbert. 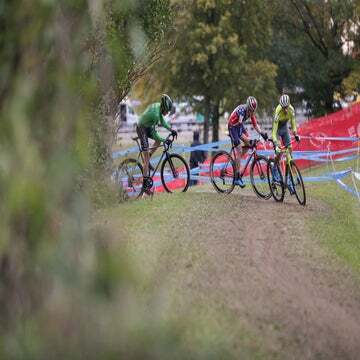 In a remarkable show of consistency, Werner won his sixth consecutive DCCX in the men’s race, following up 2016 and 2017 when he also swept the weekend races. Werner took the lead from the gun and was joined by Travis Livermon (The Endurance Collective) and Eric Thompson (MSpeedwax). “Right at the start, got the holeshot and settled in. The front group established itself, Travis, Eric, and I. The trio rode together for the first two laps but after that, Werner took control of the race, riding off the front alone to win the prime lap. In part, he was able to make his move because he rode all of the course’s features, not dismounting a single time. “One thing I was proud of was not getting off my bike at all this race, which was cool,” said Werner. Werner said he also thought the windy conditions made it difficult for Livermon and Thompson to cooperatively chase him down. Thompson out-sprinted Livermon for second but in the waning laps, he almost cracked. Livermon said it was demoralizing to put in a massive effort and not drop his rival.